Upper-echelon wingtip, distinctively detailed for elegance. Super high quality, classic design, comfortable. I love a stylish shoe that takes a glossy shine. These types of shoes are getting tougher to find, but I love them. These never go out of style. These are wonderful shoes. Probably the best shoe at this price on the market today, even at full price. American made, refurbishable, classic. I find them to be very comfortable. There is a bit of a break in period, but if they are the right size, that only takes a couple of wearings. What is really sad is that J&M has apparently ended production of these shoes and with that has also ended their factory refurbishing program. Once the inventory is gone, so is this shoe, its construction, etc. I have no clue what has happened to the American workers who built these shoes or who refurbished them when they were mailed back. Honestly, this is the best shoe in J&M's offering. Use for daily work and going out for a night with the wife. Every day use for work. Just ordered my 5-6th pair of JM Greenwich Wingtips. 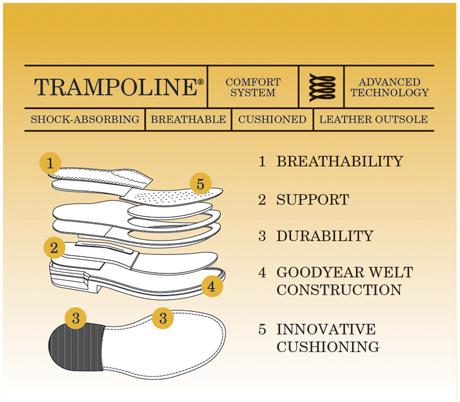 I would never purchase 6 pair of shoes from a manufacturer over a period of 18 years unless the shoes exceeded in the following areas; comfort, styling, quality, durability and craftsmanship. I look to Johnson & Murphy for quality. I maintain several pairs of dress (work) shoes to make certain of even ware. I always look for comfort and style. Johnston and Murphy shoes never disappoint, whether business of casual. The broad variety is appreciated and the quick delivery a real blessing. I have purchased JM shoes for the last 10 years and have never had an issue with the shoes.